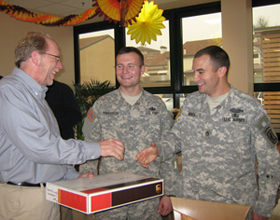 Congressman Dave Loebsack presents Christmas cards to Private First Class Herrstrom, Staff Sergeant Salvatore Giunta in 2009 (L-R). The cards were written by Iowa students. The White House has announced that two soldiers with Iowa ties will receive the Medal of Honor. The White House says former University of Iowa student Robert Miller will receive the nation’s highest military honor. The White House has also confirmed that a soldier from Hiawatha will be the first living soldier to be awarded the Medal of Honor for service in Iraq or Afghanistan. The White House says Salvatore Giunta distinguished himself by acts of gallantry at the risk of his life above and beyond the call of duty while serving as a rifle team leader with 503rd Infantry Regiment during combat operations in Afghanistan on October 25, 2007. Giunta, a Cedar Rapids Kennedy High School graduate who served two tours in Afghanistan, prevented a wounded fellow soldier from being dragged away during a fire fight while exposing himself to enemy fire. The White House says President Obama talked with Giunta and informed him he is being honored. Guinta is now 25-years-old and is currently based in Italy. Photo courtesy of Congressman Dave Loebsack’s office.